You might hear mostly from SAP basis people about I/O database operation. They used to refer to that in case something in SAP system is getting to be processed very slowly. Basically I/O operation of any computer system or part of computer system refers to communication between two parts of system. E.g. Part A of the system passes information to part B of the system. B then return processed information back to part A. From DB point of view we would say that any operation in the DB is I/O one. As it has to get information as an input; process it and return back information about its status. There are certain SAP services provided by SAP Active Global Support (AGS) like BW Go live Optimization session which might help customers to run their BW solution better. You as an customer can request those session via raising customer message on OSS in area: Remote Service Request of component: SV-BO-REQ and type query: Request for the Delivery of a Remote Service (for details see Note 560499 - Global Support Customer Interaction: Telephone/fax/e-mail or service.sap.com/goinglivecheck). 1. 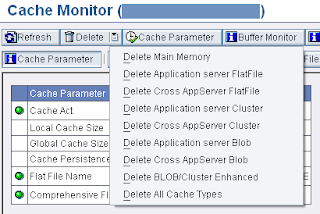 Your BW system must have the latest ST-SER release 701_2010_1 on the Solution Manager. Otherwise SAP cannot perform any of remote session. There is an ABAP report called RTCCTOOL provided that helps you to determine either you are running correct software components. 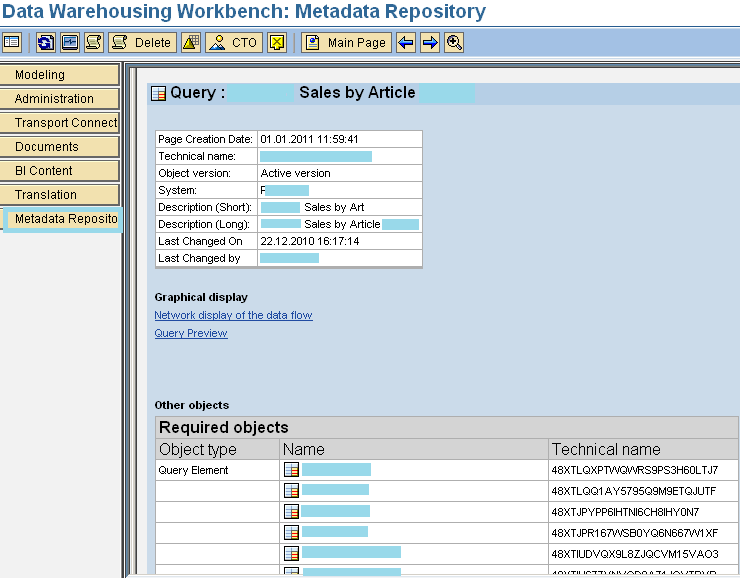 Report is analyzing tools that you need for SAP sessions by online connecting to SAP OSS. Missing articles like notes, add-ons are listed afterwards. You need to implement this missing stuff before session. For details about RTCCTOOL report see SAP Note 69455. 3. 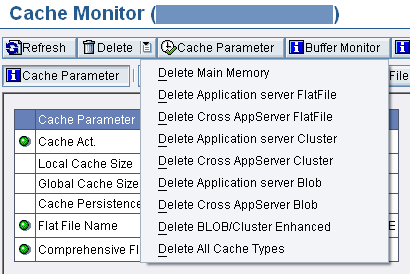 Performance collectors (TA ST03N) and OS collectors (ST06) are configured and running properly. 4. Users that you going to provide SAP must have proper authorization to perform the session. Usually users with authorization profiles SAP_ALL and SAP_NEW are provided. 6. BW statistics should be up and running. For more details see SAP Note 160777. To see all detailed description of all Support Services for Customers using SAP Enterprise Support Services see following SDN link. Idea Place: ideas.sap.com is an place where SCN community members can put ideas in any area of an relation to SAP products, services etc. SAP Community Network Shop, SAP Premium Educational Products and Resources sdn.sap.com/irj/scn/shop – meanwhile those “shop” terms was rebranded under new name SAP Community Network eLearning - Online SAP Training. SDN Code Exchange Platform: sdn.sap.com/irj/sdn/code-exchange allows community members to share and collaboratively develop prototypes, showcases, add-ons or event start-up ideas they would like to developed or already started developing in form of projects. Provides platform for support of code and release management, online discussions and blogs, documentation and issue tracking. SAP Community Netweaver Developer Edition / License – Was introduced in Jan 2010 as addition to miniSAP versions of SAP software. See here licenses comparison to find version that suits you and download it from here. Regarding previous offerings like NetWeaver Development Pack see this FAQ. For license maintenance go here. In-Memory section sdn.sap.com/irj/sdn/in-memory. Soon followed by introduction of "four-element (3 focus areas)" strategy at TechEd 2010 in Berlin. Here’s SAP offers a mixture of on-premise, on-demand and on-device applications, and better application orchestration capabilities. Regarding challenges I see in upcoming year 2011; the biggest one from my point of view would be an integration of all SCN functionalities closer together. Some parts of SCN pieces are still isolated island where user needs to login separately (idea Place) or running on different platforms (blogs, wiki, etc.). From this perspective I see a room for improvement and it is a great to see that something is going on e.g. here. A lot of people are struggling with BEx queries in lot of areas. For example when you need to know how particular key figure is calculated. This can be very painful even more in case you have several nested structures where one key figure is comprised from several others and those are again calculated, restricted etc over and over again. 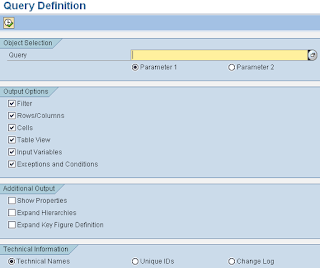 However there are some possibilities how to see query in different view apart of regular development tool – Bex Query Designer. 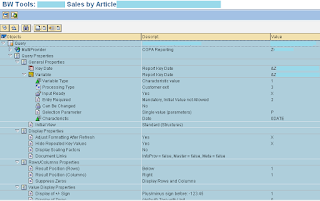 TA RSRTQ (ABAP report RSRQ_QUERYDEFINITION) - Query Definition. 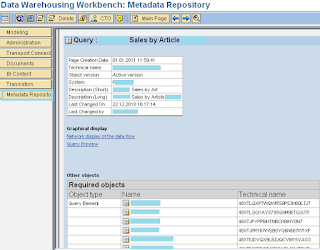 On selection screen of this tool you can choose the query which definition you would like to see. 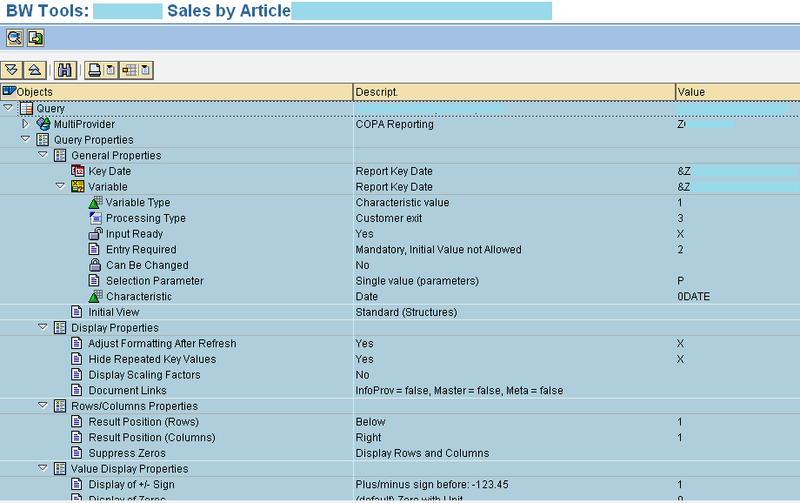 On the output screen you can see all particular properties of the query: Query Properties, Filter, Characteristic Restrictions, Selection, Default Values, Rows/Columns, Free Characteristics, Rows, Columns, Cells, Formulas, etc.